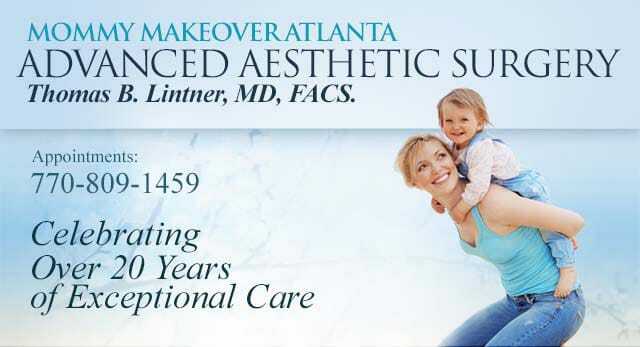 Dr. Tom Lintner is a board-certified plastic surgeon who has spent much of his career helping women and moms from Atlanta and surrounding areas rejuvenate their appearance and renew their self-esteem. Dr. Lintner is committed to offering you safe procedures, good advice, successful results, and the most comfortable treatment process possible. He also makes it a point to provide customized care and personal attention to each of his patients. At Advanced Aesthetic Surgery, Dr. Lintner is focused on giving you Mommy Makeover procedures that are the best options for your unique needs. He bases his advice on which procedures can most help you fulfill your goals, not on which will be the most profitable for his practice. This philosophy is part of Dr. Lintner’s commitment to total honesty with his patients. Dr. Lintner believes that thorough communication and education regarding all aspects of treatment options make for realistic expectations and successful outcomes. He also makes it a point to be personally accessible to his patients, and gives them his own cell-phone number to ensure they have a more direct link to him to communicate their needs. Our plastic surgeon is dedicated to providing you the best experience possible, in addition to the most beautiful and natural-looking results from your Mommy Makeover. Please take a look at Dr. Lintner’s experience and credentials, and contact Advanced Aesthetic Surgery to schedule a consultation. Thomas Lintner, MD is an honors graduate from Georgetown University in Washington, DC. He earned his MD from the Emory University School of Medicine. Dr. Lintner also completed his general surgery residency and plastic surgery residency at Emory, and later went into private practice here in the Marietta and Atlanta area. He has written a number of articles and has given many presentations on plastic and general surgery, and is committed to educating both the public and his peers on the safe and effective aesthetic enhancement options. Dr. Lintner is board-certified to perform plastic and reconstructive surgery, signifying that he has accomplished extra training and rigorous testing in plastic surgery and aesthetic enhancement procedures. Board-certified plastic surgeons are held to a very high standard, and have proven a commitment to the safest, most effective procedures possible. Dr. Lintner has served on the Executive Board of the Cobb County Medical Society, and is one of the school physicians at Marietta High School. He is also an active staff member of Wellstar Kennestone Hospital, where he served as Chief of Plastic Surgery in 2005. Dr. Lintner resides in Marietta with his wife and their two dogs. Together, they are proud parents to four wonderful sons. Their oldest son – a Furman University graduate – is married and works as a technical writer for Jackson-Spalding in Atlanta. Their second son has found success at Ole Miss Law, following his undergraduate studies at the University of Colorado. Their third son graduated with honors from the Citadel and is now an officer in the United States Army. Their youngest son is now making a name for himself in high school, and is still the tallest of his siblings! In addition to spending time with his family, Dr. Lintner can also often be found enjoying his favorite activity – sailing! If you would like more information on Dr. Lintner’s experience, or if you would like to schedule a consultation with Dr. Lintner to talk about your aesthetic enhancement goals, please contact our practice.